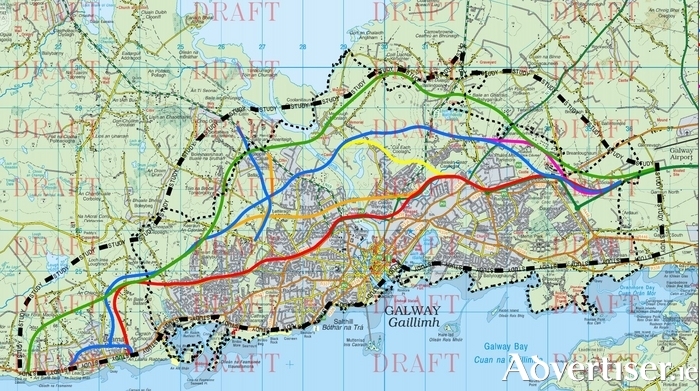 A seventh route for the highly controversial N6 Galway City Transport Project is being considered following the groundswell of opposition to the six routes already proposed. It is understood the ‘seventh route’ will include sections of the previously outlined routes and paths not included in the existing options. It comes following a request from stakeholders and consultants in recent weeks, for more time to complete the process, which was originally intended to select one of six route options for the road. The emergence of the 'seventh route' also challenges claims that the existing six routes precent the consideraton of any kind of alternative proposals for the N6. The existing N6 routes have caused enormous controversy and led to opposition from the public; NUI Galway, whose campus could be split in two by the road; businesses; and politicians, given that the routes proposed could involve the demolition of around 130 homes and/or see the Galway Races - which generates €60 million a year for the local economy - suspended for two/three years to allow for construction. This latest development in the controversial saga will be watched with great interest, as many will hope the seventh route will not involve such a high cost in terms of people’s homes. Fine Gael Galway West TD Brian Walsh has given the as yet undefined ‘seventh route’ a cautious welcome but said he would “wait to assess the degree to which the new route would address his concerns” before deciding whether to support the plan. “It has to be one that is deliverable, effective, and that minimises negative impact on local businesses, amenities and homes, because those six route options were not,” he said. Dep Walsh added that it was a good sign that planners are “sitting up and listening to people’s concerns”. Earlier this year Dep Walsh suggested the N6 ring road routes could be scrapped in favour of a variation of the original Galway City Outer Bypass progressed under Imperative Reasons of Overriding Public Interest, which would circumvent EU concerns over bog cotton. His fellow Fine Gael TD Dep Seán Kyne said use of an IROPI is not possible because it is only “when there are absolutely no alternatives”, but the N6 presents six other routes so far. Page generated in 0.2077 seconds.